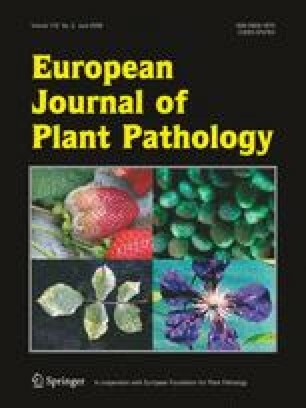 A collection of 39 potato virus Y (PVY) isolates from tomato, originating from several commercial crops grown in north-east Spain, was characterised by biological, serological and molecular assays. In general, no correspondence among the three different assays was observed. The results of biological characterization by inoculation of PVY isolates to Nicotiana spp. and pepper plants did not coincide with the differentiation provided by enzyme-linked immunosorbent assay (ELISA) using monoclonal antibodies specific to PVYC, PVYO/C or PVYN strains. In some cases this was a consequence of mixed infection of different PVY strains, which selectively infected the different hosts as demonstrated by the ELISA test. Nevertheless, the majority of PVY isolates collected from the same tomato fields showed a high degree of similarity, which indicated the predominance of one-source of infection for each tomato field. Comparison of isolates based on genetic studies did not correspond well with pathological properties, because amplification by reverse transcriptase polymerase chain reaction (RT-PCR) was also selective for some PVY isolates. The sequence analysis of some PVY isolates revealed three main clusters corresponding to NTN and N potato-type strain and NP (non potato-type) strains. Tomato seems to be slightly selective with respect to PVY infection and it is possible to find a great genetic diversity of PVY isolates belonging to different groups, mixtures and probably recombinants, which can complicate the adoption of cultural measures and the development of resistance programmes to control the disease. We would like to thank Dr. C. Lopez for his critical discussion. This work was financially supported by RTA02-071, Instituto Nacional de Investigaciones Agrarias (INIA), Ministerio de Agricultura Pesca y Alimentación, Spain.